From Thomas Sabo's collection is this classic Blue Leather Symbol Bracelet. A perfect gift for him. This Thomas Sabo Blue Leather Symbol Bracelet 19cm features a plaited Blue leather strap which gives the bracelet quite a chunky style and authentic look. The round clasp features lots of small symbols inside, which gives the bracelet a masculine edge. These symbols represent faith, love and hope. The branding 'Thomas Sabo' is featured in small text around the clasp. 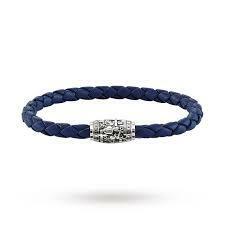 This bracelet is crafted from 925 Sterling Silver and Blue braided real leather.